As I have been going through my Beatles fanzines and news clippings the past few weeks to find items to share on the blog, I began to notice a theme as the material began to hit the early 1970's. A very obvious rifted was seen among Beatle fans. Some fans were feeling like other fans were treating the Beatles as they were their personal possessions. From what I can tell, things got ugly between certain individuals. You can still see a little bit of this in fans today, although I would say that things aren't too bad. It is mostly when the topic of what fans get pulled up on stage at Paul's concert gets discussed (why did so and so even make a sign? She has been on stage three times now! Give someone else a chance...etc). But for the most part, I think we work together and no longer are against one another. I blame a lot of the issues among the fans in the early 1970's on the age of the fans at that time. Late teens/early 20's can be a hard time for some--moving out of childhood and into adulthood. Monday June 5, 1972 is a day which I will remember for more than one reason. 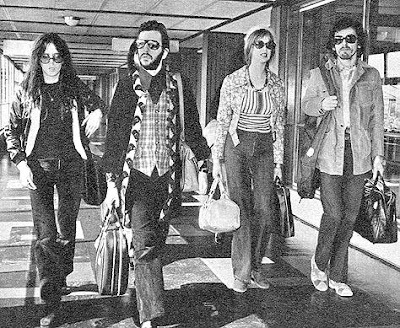 For on this day, for anxious “Beatle fans” Lynn, Linda J., Ruth and myself set out from Connecticut for 1700 Broadway where it was expected that a meeting was to be held between Allen Klein and John, Paul, George and Ringo to discuss their partnership shares in Apple. Since Linda J. was the only one who had ever seen the Beatles before at the Shea Stadium concert in 1966, you could imagine how excited we were that we might be able to see at least one of the boys. What we didn’t know was that in order to get any information on what was going on or to be able to camp out right in front of the steps leading to the entrance without being told to get lost – you had to be a P.B.N.B.F: A Phoney Brown Noseing Beatle Fan <sic>. Those who were fortunate or unfortunate enough to hold this title were able to ride up and down elevators and go in and out of ABKCO without any questions since they were all “such good friends” with those working up at ABKCO. They also felt that they had the right to shout orders like a marine sergeant and even to determine who was “worthy” of seeing an of the boys if they show up They only bothered with you if they wanted to know if you saw any of the boys going in or coming out. Ringo came out first, and believe me it was a moment I know I’ll never forget. Maybe the rest of us would have had a longer glimpse of Ringo if those who were waiting on the steps had not made a mad surge towards him as he came out. After having gotten over the shock that we had all see Ritch, we all patiently waited for George to come out. As he came out walking quickly up the street we all looked at him in the quiet of the evening, some of us following after him in a half daze until we heard a loud scream from one of the “darlings” of the group, “DON’T FOLLOW GEORGE!!! !” Well at that moment, even George was forced to turn and see where that command was coming from. The person who was so quick to give all the orders was even quicker in hailing a cab. I wonder what fire she was off to, I mean she couldn’t have been following George now could she? Everyone showed disappointment over the fact that John (he was in Chicago) and Paul had not come as we had all hoped for. But even sadder fact was the way many of you who were there on Monday chose to act. Maybe some of you will say that I have been unfair in what I said. But let me ask you this: How would you have felt if you were the ones seeing them for the first time, and there were those who felt if you were the ones seeing the Beatles so many times, that they should be the only ones allowed to see them? It’s funny that while the Beatles are singing “Come Together” and “All you need is love” their “loving” fans are trying to figure out who to stab in the back next so there is one less threat to their chances of getting to them. Remember, no one owns a copyright to the Beatles. They belong to anyone who has ever felt a little bit better knowing that such as a thing as “The Beatles” was a part of their lives. Note from the president: The most unfortunate thing about that letter (as Mary Ellen pointed out) is that this certain thing does go on in New York, London, and any big or small city where there are a lot of fans who are involved with them. It is sad really. I know, I’ve been through it all, and I must confess I was a bit possessive with Paul (when he was here for 5 months about 1 year ago), but I had a damn right to be. You see there are two groups of fans. I should really say a few groups: first you get the distaste of groupies (eck!). Then comes the little babies who pull their hair and scream at them, and then US. The people who have been around for 8 ½ years now, and know “the score” on what is going on. I thank George for writing that song, Apple Scruffs. Thank God, that four of them know the difference. Great letter and true letter more to the point from past experiences - the NYC 69 to early 70's with the "ingroup" was awful. Shame on them. Sadly, your assessment and this account mirror my own experiences as a young Beatles fan in the late '70s, especially at the Beatlefests here in L.A. The only place there wasn't a cliquishness was at the monthly swap meet in the Capitol Records parking lot – the record collectors were much nicer than the fans I'd meet at other events. It is really unfortunate. Some fans really have this "I am a better Beatles fan than you are" attitude. I really hope things are better now than they were in the 1970's in that area. However, I still see some mean cliquish behavior among fans even today. I think it hits me hard because I am not and will never be in the "cool kids Beatles fans" group. Sara, you're in the ultra cool Beatles fan group! This blog is one of the coolest Beatles things around. And the complete lack of snobbishness makes everyone feel welcome. Rock on... and THANK YOU for the great space you have created here! I did a John-in-Ojai pilgrimage last year. Been going to Ojai for years, but never knew John's history there 'til I read about it online. The internet (including this blog) have made it so much more interesting to be a Beatles fan!